More than any other gadget (yes, even smartphones), battery life for smartwatches are a huge selling point. Instead of being just another gadget tethered to another cord or charging dock, a longer battery life means more convenience for a wearable that for the past century never really required charging. Motorola advertised the new Moto 360, arguably the most well-designed smartwatch (for at least the next couple of hours), as having a 320 mAh battery, slightly larger than the Samsung Gear Live but not as beefy as the G Watch's 400 mAh battery. 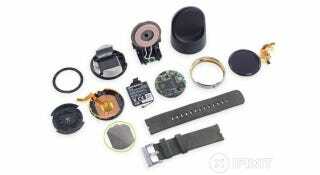 However, iFixit's teardown of the Moto 360 revealed that there's actually only 300 mAh battery inside its casing. Although the reason for this marketing duplicity is unknown, our own real-world tests of the Moto 360 show that the wristwatch is capable of getting through the entire day, and if on the right settings, a full 24 hours. The Moto 360 is also the first Android Wear timepiece with an ambient light sensor, so whether you're an outdoors person or a shut-in could also affect overall performance. The typical battery capacity for Moto 360 is 320 mAh and the minimum is 300 mAh. In the mobile industry, sometimes both the minimum and typical capacity is listed on the battery, with the typical capacity quoted as the official battery size. Both figures are included on the batteries of our Moto X, Moto E and Moto G devices. In the case of smaller devices, we aren't always able to list both figures. For Moto 360 we only had room for one figure and choose to list the minimal capacity of the battery. We see how this can be confusing and we will look into ways to add the typical capacity as well in the future.